Thought I would post a photo of some new additions to my Disc Golf bag and collection. 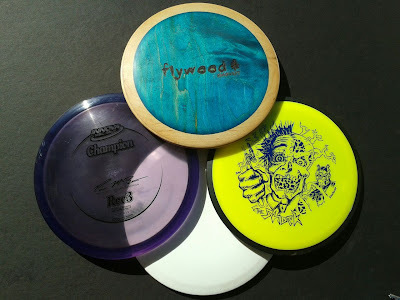 At the top is a hand-made wood disc from Flywood. Although not PDGA approved, these discs are made to be thrown and will last for years. I had to check one out for myself and the thing is so darn gorgeous that I can't bring myself to thrown it. So I purchased another and no matter how pretty it is, I'm taking it to the course once it arrives in the mail. Now, for the new disc in my bag. Innova's latest version of one of the classics. Juicy purple Champion Roc3 has been fun to throw and has some surprising glide. Not going to take the place of my Legacy Ghost, but it has found a spot in the bag. On the right is the Zam/Skulboy custom stamped MVP Shock. This is from the 1st run batch and for my non-powerful arm, flies a lot like my beloved Latitude 64 Saint. Beautiful straight S curve with very little fade. Keeper. The white disc on the bottom is a prototype Legacy Patriot Fairway Driver. When this disc came out of the mold, it was a tad too soft for the Rico Bros. liking so they had the plastic stiffened up a bit and then ran the 1st run Patriots. I was lucky enough to get one of these from the small stack that exists and the feel and grip on this thing is nothing short of amazing. It is also said to be the most stable plastic of the Patriot runs. The ricos have assured me that they will revisit a softer version of the Patriot in the future. Good news.